Once upon a time a sparrow laid few eggs in its nest and went away in search of some food. During that time, an elephant came that way and to rest under the tree. Even after seeing the little sparrow's nest in the branches, the elephant brushed his body against the trunk of that tree with a great force. Because of this the eggs fell from the nest and broke. When the sparrow returned back to the nest, she found the broken eggs and became very sad. 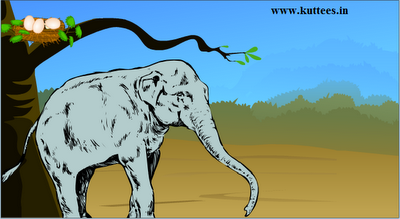 The little sparrow wanted to punish the elephant for his mistake, but it didn't know how to do that. So the sparrow went to one its friends, a woodpecker and told him about what had happened. The woodpecker felt very sad for the little sparrow. He felt his friend - a small frog who lived in that same forest could help them in this. So he took the sparrow to the frog. 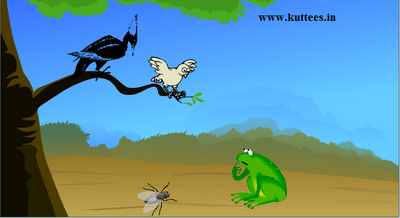 The woodpecker told the frog about what the elephant did and asked him for some idea to kill the elephant. Hearing the story, a fly - another friend of the frog - also joined them and told them that even he would like to be a part of their group. Now all the four thought about a plan to trap and kill the elephant. As per their plan the next day when the elephant was on its way to drink water, the fly flew near the elephants ears and started making the buzzzzing sound. The elephant was annoyed with this and closed his eyes for a second. As instructed, the woodpecker was waiting for this moment. He quickly pecked on the eyes of the elephant. The elephant couldn't bear the pain. He couldn't even open his eyes. He wanted some water to wash his eyes, but didn't know on which side there was water. Now, the frog who was standing near the marshy land started making the croaking sound. The elephant heard the sound and thought the water was on that side and walked over the marshy land. The elephant drowned in the marshy land and died. MORAL : With unity and smartness, we can beat even the strongest enemy. thank you for your time and comment. This is a popular panchatantra story and hence we didn't modify the story. thanks once again for the comment. Please do share your thoughts to help us improve our web site.